Ying Yang is very interesting puzzle variation in which one has to divide the area into white circles and black circles of continuous connected area so that no 2x2 area with either white circles or black circles is formed. 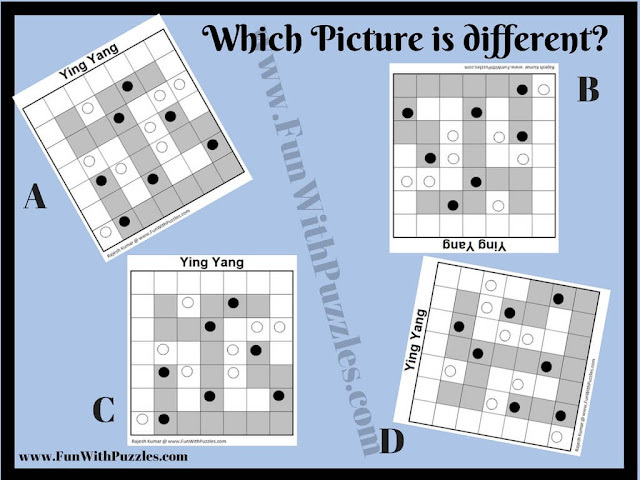 Here is the Picture Riddle created using the Ying Yang Puzzle. 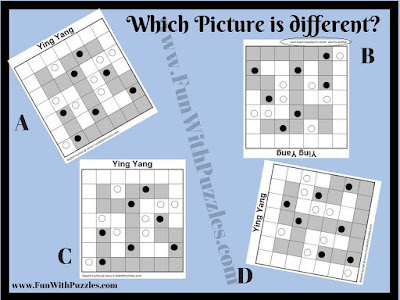 In this Odd One Out picture riddle, four Ying Yank puzzles are there marked with A, B, C and D. Three of these puzzle pictures are exactly alike and only one is different from other three picture. Your challenge in this picture riddle is that you have to find the picture image which is different from other pictures. Answer of this picture riddle is given at the end. Can you find which picture is different int this tough Odd One Out Riddle?